View of “Howard Wise Gallery: Exploring the New,” 2013. Center: Otto Piene, Licht Ballett (Light Ballet), 1969. A retired midwestern executive who began dealing AbEx paintings but wound up a proselytizer for the techno-utopian avant-garde, Howard Wise was one of the most unlikely characters of the New York art world of the 1960s. His eponymous gallery was primarily devoted to works made with a wide range of technological materials—from phosphorescent paint to phototransistors and phone lines—though the space is mostly remembered for its pioneering efforts in the nascent field of video art. In Wise’s view, the works he showed “humanized” the technologies they utilized, while taking them out of circulation as the efficient instruments of an emergent technocracy; it is partly this attitude that makes him an important, though largely unacknowledged, godfather to those in the art world embracing new technologies today. In the spirit of numerous recent shows devoted to iconic exhibitions or characters from the recent past, “Howard Wise Gallery: Exploring the New” revisits Wise’s legacy through the prism of a modest sample of works, most of them long belonging to the Wise family. 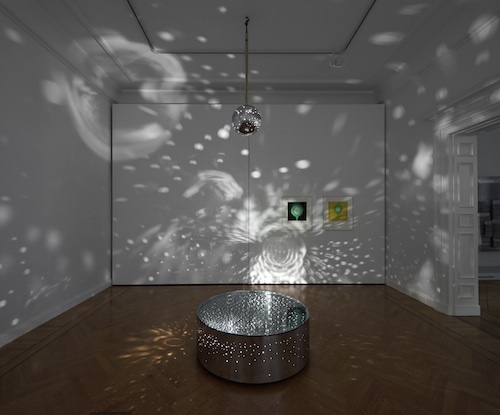 These include works by some of Wise’s most intriguing artists, such as Otto Piene’s Licht Ballett (Light Ballet), 1969, which is a low, perforated chrome cylinder housing rotating bulbs that cast ambling dots of light around the back room. In a short color video on loan from Electronic Arts Intermix (the video art distributor that Wise founded in 1971), Charlotte Moorman performs at the gallery in Nam June Paik’s TV Bra for Living Sculpture, 1969. But accompanying these direct confrontations with technology are more traditional works, like a charcoal drawing by Piero Dorazio, and Peter Sedgley’s colorful, hardedge prints from his “Looking Glass Suite,” 1966. Herein lies the show’s greatest value: In its juxtaposition of works, it recaptures the open exchange of ideas that characterized this moment, before the ossification of “new media” into a ghetto of contemporary practice.